French food is great, I think we can all agree on that, and I like having a snoop around French supermarkets when we are over there. The cheese, bread and cured meats, caramels, jams, chocolate and everything else in between. I heard about Bonjour French Food on Twitter, a monthly hamper full of unique and sometimes hard to find French treats, with a specific theme each time. They were kind enough to offer me a box to review, and I eagerly awaited their next shipment date at the beginning of November. The theme for November was tartine, a traditional French open sandwich layered with any number of things – cheese, vegetables, pate or cured meat. A perfect quick lunch. 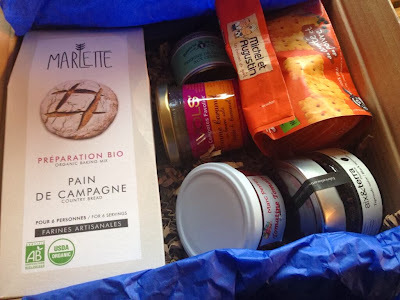 My box contained a mix to make Pain de Campagne (country style bread), pork and mushroom terrine, tomato spread, olive tapenade, comte biscuits and apple caramel. Our plan for the box was to nibble through the contents for dinner, with some excellent cheese and bread (making the pain de campagne had to wait for another day). The tomato spread was by far our favourite – so intensely tomatoey, like fresh summery tomatoes with a hint of herbs. Olive tapenade is one of my favourite things, but it is normally not made very well, due to the cheapness of olives used. The Aix & Terra black olive tapenade was gorgeous, so intense and really good quality. You just need a little spread on a piece of bread. I’m sure this would be great stirred into pasta, although it is a little precious for that. The little spreads made a lovely addition to a cheeseboard and we nibbled on the gorgeous Michel et Augustin comte biscuits with a glass of wine, after dinner. They were generously packed with cheese and I liked that they are made with wholemeal flour – giving a nice nutty taste and extra texture. Finally, the sweet. The apple caramel reminded us of the apple galettes we had in Paris – intensely fruity, buttery and sweet. I made french toast for breakfast the next day, and the caramel worked perfectly in the place of syrup. We really enjoyed nibbling through our box, it was full of interesting brands, most of which are small producers, that we’d not heard of before. The box came with a card explaining the stories of each item, and where you can buy them. It felt like a real insight into French food, and like a great secret that was being shared with us across the Channel. Each box is £29 per month, with discounts if you sign up for longer, quite reasonable when you think about the quality of each item, and the time that is spent sourcing them. Find out more here. Thank you to Bonjour French Food for sending me a box to review. This sounds like pretty good value… I will investigate as a potential foodie gift!